EGN scripts are an excellent value for money. I initially had some misgivings about the quality of the script because of the low price. However, I decided to give a try. I bought egSuperBusiness and the quality I got exceeded my expectation. Above all, The customer support team is wonderful. They helped me to make some adjustment on my scripts when I was having some challenges with my payment processor, even though I my webhost ( not EGN) not could not resolve the issue. 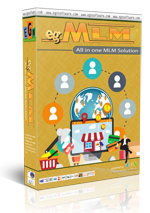 I recommend EGN to everyone looking for a good network marketing software. Your Company Is very Powerful and your very good sprout for your Clients. . .